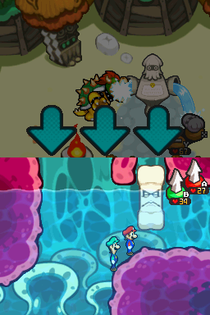 A Bone Thwomp is a species of Thwomp that acts as a bone in Bowser's body in Mario & Luigi: Bowser's Inside Story. They appear throughout the Pump Works. Bone Thwomps are more of an obstacle than an enemy, blocking Mario and Luigi's path. If Bowser drinks water, Bone Thwomps will float, allowing the bros. to proceed. This enemy reappears later in the Airway, but they are shorter, and plumper. They are used as stepping stones to access higher ground. This page was last edited on February 25, 2018, at 21:43.